Republican presidential front-runner, Donald Trump has stunned the world by amassing political support and electoral success thus far by dwelling on controversies. Trump adopted a viable but cheap publicity package of stealing news headlines by making defamatory statements against eminent Americans including other groups across the world on the basis of nationality, physical disability, gender, race or religion. The real estate mogul has been called unspeakable names portraying sexism, promiscuity, insensitivity, racism, lack of religious tolerance amidst others describing oddity. Donald Trump seems to be stuck to the bizarre pattern of entertaining his audience by taking close jabs at political opponents to thrill his teaming followers. This has also helped with the focus of media attention on him. Donald Trump gradually became the highlight on CNN reports and other top media platforms across the world with a stronger presence on social media as his supporters including haters were indirectly promoting his name by merely discussing him. In no time, the smart billionaire who claims his motivation is not always to make money but 'play the game', gathered so much momentum and confidence that he challenged Fox News to go ahead and make losses without him in the Republican party debate they anchored in January, 2016. Controversy sells they say and Donald Trump seems to have mapped out a risky game plan as an entrepreneur which has played out well to his advantage. The truth about Donald Trump is that his hate speeches devoid of diplomacy and civility have achieved the desired result which is a point of concern to Political Analysts. This agrees with the assertion that Trump could be speaking the minds of a sizable number of Americans giving him support at the polls. Donald Trump has made a couple of inflammatory statements against the Muslims. He believes they hate America, hence the need to ban them from coming into the country. He has proposed that the mosque should be put under close surveillance to foil terrorist attacks. “Frankly, we’re having problems with the Muslims and we’re having problems with Muslims coming into the country," he told Fox Business. At a recent campaign rally, in Wichita, Kansas, the slippery tongue reportedly called out Nigerians for coming to America to take their jobs thereby limiting the chances of the first class citizens. According to Trump; “We need to get the Africans out. Not the blacks, the Africans. Especially the Nigerians. They are everywhere. I went for a rally in Alaska and met just one African in the entire state. Where was he from? Nigeria! He is in Alaska taking our jobs. They are in Houston taking our jobs. Why can’t they stay in their own country? Why? I will tell you why. Because they are corrupt. Their Governments are so corrupt; they rob the people blind and bring it all here to spend. And their people run away and come down here and take our jobs! We can’t have that! If I become president, we will send them all home. We will build a wall at the Atlantic Shore. Then maybe we will re-colonize them because obviously they did not learn a damn thing from the British”. Donald Trump said that he do like to “take out” the families of terrorists. “I would knock the hell out of ISIS… [and] when you get these terrorists, you have to take out their families.” the Republican presidential candidate said on Fox & Friends. “When Mexico sends its people, they are not sending their best. They are not sending you. They are not sending you. They are sending people that have lots of problems. And they are bringing those problems with us (them.). They are bringing drugs, they are bringing crime. They are rapists. And, some, I assume are good people'' the business mogul said. He has promised to build a great wall around the Mexican-American border to restrict the entry of immigrants with Mexico undertaking the costs. Trump once called all women gold diggers due to their hatred for prenups. “The most difficult aspect of the prenuptial agreement is informing your future wife (or husband): I love you very much, but just in case things don’t work out, this is what you will get in the divorce. There are basically three types of women and reactions. One is the good woman who very much loves her future husband, solely for himself, but refuses to sign the agreement on principle. I fully understand this, but the man should take a pass anyway and find someone else. The other is the calculating woman who refuses to sign the prenuptial agreement because she is expecting to take advantage of the poor, unsuspecting sucker she’s got in her grasp. There is also the woman who will openly and quickly sign a prenuptial agreement in order to make a quick hit and take the money given to her.” - Trump: The Art of the Comeback, 1997. He has been accused as seeing women as objects of pleasure. — Donald J. Trump (@realDonaldTrump) May 7, 2013. Trump in an interview with CNN while defending his proposal to ban the Muslims from travelling to the United States of America claimed he was only offering his candid opinions on issues which other aspirants thread with caution due to the financial donations they are enjoying from stakeholders who end up conditioning their views on issues raised. According to him, his highly esteemed financial status affords him the advantage of footing the huge demands of election campaign costs giving him the impetus to bare his mind without fear or favour. Trump has also been accused of defaming African leaders who he alleged are corrupt but these widespread assertions couldn't be confirmed with video or audio evidence. In the spirit of truthfulness and utmost sincerity, Africans have to be grateful to the bluntness of Trump as he confronts us with the reality of life. Several unscrupulous African leaders have underdeveloped their home countries through massive siphoning of developmental funds which are stashed or invested in other countries at the detriment of Africa. Most affluent men go as far as running medical check-ups abroad on a slight head-ache or stomach disorder with minute amounts of money allocated to develop the health sector of their home countries. Even when budgetary allocations are made, it falls into a specially designed conduit pipe designed to loot the commonwealth e.g. the recent budget padding. Nigeria today loses N1 to N3 billion to medical tourism yearly according to Medical Tourism Association's Research, Surveys and Statistics report made in November, 2015. What about education which is supposed to be the breeding ground for future leaders? It has been ridden with heartless acts of corruption and calculated steps of mismanagement. Education in Nigeria is marred by insufficient funds and poor welfare facilities, ASUU (Academic Staff Union of Universities) strikes, lack of motivation or passion among lecturers to impart knowledge and appalling revelations like the office of the Vice President, Yemi Osinbajo's library getting more allocations than 11 out of 22 federal polytechnics in Nigeria and other Universities before the budget was reviewed by the National Assembly. This is simply because the children of the privileged are peacefully enjoying their studies abroad with the best facilities. Nigeria churns out millions of graduates that still lack a vivid understanding of English language or the art of formal writing. I have taken my time to observe closely the views of some average Nigerians on Television stations when random people are interviewed on the streets in the occurrence of crisis or an accident; mostly I get embarrassed by the use of tenses even by our so-called educated people. In the aspect of technological innovations, our professors with white grey hairs are still yet to make a significant breakthrough with an innovation that will change the world. Nigeria according Pastor David Oyedepo has more PhD holders than 4 European countries, yet we look up to the global north for developmental strategies. Most of them are only experts at running 'mark banks' where they probably save students' truly deserved scores rather than compensating them for their hard work. If I am to talk hard here, we all have to accept that Nigeria is currently being run on its 'reserve fuel', the bus may soon finally park up before we reach our El Dorado which is millions of miles away. Our leaders only believe in this country on paper. A close study of the children of the privileged in Nigeria will reveal that they have dual citizenship. Again, the contagious effect of sticking a leg out the Nigerian borders has spread to other classes in the society. Nigerian celebrities have also strategically worked out citizenship by birth for their unborn babies not out of distrust for the medical system which boasts of talented heads but a contingency plan concerning the child's future. The blood of our naira is on the head of the privileged class who have shown an unprecedented apathy for locally-made products. Even despite the restrictions placed by the Central Bank of Nigeria on the circulation of the U.S dollars to revamp our economy, these set of people due to their addiction to foreign goods and services are scavenging the black markets and keeping their agents actively in business thereby 'killing' the already dead naira. We can take a safe stand by blaming President Muhammadu Buhari for the current economic woes of Nigeria but what we expect from a country that runs a monocultural economy? 75% of our national income is from crude oil and 95% of our foreign exchange is from the exportation of crude oil. Its laughable for people to be myopic enough to believe the economy will wax stronger in the face of a 70% depletion in the price of crude oil in the international market. The bitter reality is to ask if Nigeria really has an economy. The fact that we still import toothpicks and even poultry eggs according to Nancy Iloh of the Money show, African Independent Television isn't far from the truth. Nigeria has celebrated an idea of creating a minimum of 400,000 jobs through the production of pencils in 2 years time. The Ministry of Agriculture is also struggling hard to convince Nigerians on the efficacy of importing GRASSES from Brazil for our ruminant animals. It’s an anomaly for a country like Nigeria that produces 2.5 million barrels of crude oil in a day and earning about N5.021 trillion between January to June, 2015 to have over 60% of its populace living below the benchmark of poverty which is a dollar per day; simply put ''N200 recharge card money'' (approximately). When the controversial online news platform, Sahara Reporters started exposing the names of Nigerian politicians with house in Dubai, United Arab Emirates, several media platforms lifted the half-truths and conventionally spread it around for the traffic without weighing the issue. Speaking the gospel truth, only a few or virtually no prominent politician in Nigeria doesn't have a house abroad not only for business reasons but also for the fear of a revolution in the magnitude of the Rwandan genocide in 1994. One day, the predictions of Karl Marx about the masses (proletariat) rising up against the oppressive rich class (bourgeoisie) may take its course and blood maybe the only atonement for their sins. African leaders have stolen votes, destroyed their homes and are going abroad to enjoy the painstaking sweat and calculated developmental works of great leaders in developed countries. But there is no place like home. No matter how well you try to transform a rented apartment, the truth is your freedom will always be limited because the property is not yours. We are living on borrowed time. More Donald Trumps will still rise up as developed countries are getting tired of providing the cushioning effect for the misdeeds of African leaders. Some social media users have been foolishly advising the University of Lagos 5.0 GP first class graduate in the person of Ayodele Dada to head out of Nigeria if he wants to have a bright future. This again is a problematic of the global south. It’s simply called brain-drain as the best heads leave for the developed countries seen as greener pastures. The average heads or a few courageous brilliant ones are forced to stay back home and invest their ideas towards the development of the country. Nigerians are brilliant people if only an enabling ground could be established to develop talents. Some Nigerians are soaring high abroad like Dr. Bennet Omalu in the U.S who was the first person to discover the link between football players and Chronic Traumatic Encephalopathy, or CTE, and how much the National Football League did or didn’t know about the effects of concussion on its players. What about the Nigerian entrepreneur, Chinedu Echeruo who sold his 'Hotstop' company to Apple Incorporated for $1 billion? Another person is Dr. Osatohanmwen Osemwengie who has been an integral part of the United States armed forces, building drones for the U.S army. We also have one Paul Orajiakor who build a $10 million toy company, Auldon Limited that specializes in the production of African-themed toys and the list is endless. How can we achieve greatness when torch-bearers like the Dadas leave to develop America with another Donald Trump patiently waiting to repatriate them under the guise of economic burden in the nearest future? We should offer gifts to Donald Trump for the courageous truths that were never planned to go public. The underdevelopment of Africa has an adverse psychological effect on the people. It has led to a slave mentality. The truth is, most of some Nigerian masses have only remained in this country not because they believe in this country but simply due to the lack of the financial means to leave. And even when a highly educated Nigerian emigrates, he happily discards his brilliant school certificates to venture into odd jobs he wouldn't dare to do back home. 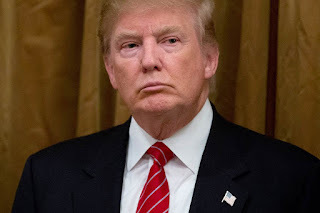 Donald Trump has vowed to revoke the citizenship of Africans as widely reported, particularly Nigerians living in the United of America for taking their jobs. I sincerely hope and pray its not true. Those living in the imaginary world of the belief that the revocation of citizenship could never take place should remember President Muhammadu Buhari did the same to the Ghanaians and other immigrants in Nigeria on the 17th of January, 1983 when the Nigerian economy was experiencing a downturn. According to the Encyclopedia, some 700,000 Ghanaians departed during the following weeks of the Federal Government's order, as did smaller numbers from Benin, Cameroon, Chad, Mali, Niger, Togo, and Burkina Faso. In 1985, about 200,000 to 250,000 aliens were expelled, including about 100,000 from Ghana and 50,000 from Niger. I can picture the fears of the established Nigerians abroad as Trump continues to soar high in the polls. In fact, a majority of the Republican and Republican-leaning voters believe the party should unite behind Donald Trump at a contested convention, according to a national youth Monmouth University poll released recently. It spells doom for the threatened immigrants. Imagine the economic burden if those people running to several thousands are sent back home, an already vulnerable Nigeria with people already dozing off in the wait for change. I urge Nigerian pastors and Motivational Speakers to brace up for motivational speeches as several people with American accents will need them for mental strength if the expected happens. I wish I could join the novice class in hating on Donald Trump and wishing him dead but the realist school of thought has taught me that relationships among nations of the world isn't built around love but the pursuit of selfish national interests by actors to amass power for self-preservation. All hope is not lost. It’s never too late to go back to the drawing board and re-strategize as Africans. Former South African president, Thabo Mbeki who is like our Nostradamus in this case once pictured the ill-fate of African countries in the North-South economical divide and preached the message of African Renaissance agenda. He advocated on a better collaboration among African countries not only at the social level but economic level. According to him, he proposed intra-continental trade as a means of ensuring auto-centric stability and development. It is time to employ the laws of comparative advantage by famous Economist, David Ricardo by looking inwards, trading among African countries in diverse specialties and keeping international relations at least within the continent on a 60% note rather than engaging in imbalanced trade activities with developed countries. This is high time we took hard decisions like the great Mao Zedong of China popularly referred to as Chairman Mao, Chinese Communist revolutionary and the founding father of the People's Republic of China. He transformed China form an agrarian society to an industrialized state through the Great Lead Forward initiative. This came with unforgettable sacrifices leading to a widespread famine whose death toll is estimated at between 18 and 45 million. Today, China is debatably the largest economy in the world or at times falling behind the U.S. We should stop being beggars loitering around developed countries for assistance that always come as Greek gifts thereby impoverishing us the more. In fairness to the heavens, the African continent is blessed with massive human and material resources regardless of what people think. The time has come for us to take our destinies in our hands before more Donald Trumps will rise across the world and humiliate the next generation. Let's see Trump as a blessing and save Africa.